Did you know you could make maple syrup right in your backyard? When the night temperatures dip into the 20s and the day temperatures soar into the 40s, the maple tree sap starts running. Maple tree sap is collected through February, March and April. 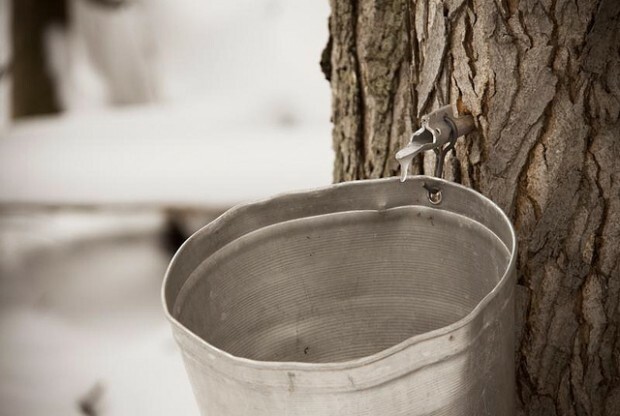 Maple trees are tapped and a bucket is hung to collect the sap. The sap is boiled and the water evaporates and the sweet syrup is left behind. And did you know that it takes 40 gallons of sap to make one gallon of syrup? The John R. Park Homestead and Conservation Area helps you discover the first taste of spring at their Maple – First Taste of Spring eventwith history lessons on maple syrup making, from tree tapping and sap boiling to blacksmithing demonstrations and snow maple taffy making. The Homestead will also offer Maple March Break for Families on Tuesday, March 15th and again on Friday, March 18th at 1:30pm sharp. John R. Park Homestead is located at 915 County Road 50, east of Colchester on the lake. For more information, or to make a booking, call (519) 738-2029, email [email protected], or visit www.erca.org.